How the restaurant chain can bounce right back to strong earnings growth this year. Net income annual growth. Source: BWLD financial filings. Given that its stock is priced for market-thumping growth, this could be a concern for shareholders. But long-term investors don't need to panic: B-Dubs is set to jump right back into substantial earnings growth this year. After all, 2015's earnings slowdown wasn't caused by operating problems, as was the case in 2012, when profit growth slumped as chicken wing prices spiked. That year, cost of sales soared by 50%, which pushed overall food costs up to 32% of sales from 28% the prior year. B-Dubs' bottom-line profitability took a huge hit as net income margin dove from 6.4% of sales to 5.5% . Management has greatly reduced that business risk by shifting to a weight-based (as opposed to piece-based) chicken-wing ordering system. As a result, food costs have stabilized, rising only slightly last year, to 29.6% from 29.1%. the year before. Instead, profits were sluggish last year because management wrote a huge check to buy back 41 locations from a franchisee. That one deal pushed B-Dubs to more than 50% company-owned locations. McDonald's (NYSE:MCD) owns less than 20% of its restaurants, and is currently raising money by selling corporate-managed locations to franchisees. Chipotle (NYSE:CMG) doesn't participate in the franchise model at all, and would rather own and operate all of its restaurants. In announcing the franchisee buyout deal last year, B-Dubs CEO Sally Smith predicted that the move would produce long-term earnings growth, even as it hurt profit in the short term. Executives backed up those words with hard numbers last week, projecting that the company will increase earnings by between 20% and 25% in 2016. B-Dubs plans to achieve that bounce with help from adding 85 new restaurants, mostly company owned, to the store base. It also sees sales at existing locations rising at something close to the healthy 4% comps pace it posted last year. Higher menu prices should make a big contribution, roughly 2.5%, to this year's comps gain. In addition to the strong profit jump, B-Dubs announced plans to allocate $200 million on capital expenditures this year, excluding any additional franchise buyouts it might make. "The Buffalo Wild Wings brand is strong and vibrant and we continue to invest to drive sales and deliver earnings growth for our shareholders," Smith said. That's a significant increase from the prior year's $178 million capex forecast, demonstrating that management is confident that it can invest in improving the business, while still producing market-leading profit growth for shareholders. B-Dubs' stock price doesn't appear to reflect the market-beating growth that it is likely to produce this year. Its forward P/E ratio is just 23 times the forecast $6.10 per share in 2016 profit. That's not much of a premium to McDonald's 21 times earnings, even though Mickey D's is only expected to increase earnings by 8% this year. Chipotle's sales and profits are headed sharply lower right now, but it is valued at a huge premium to B-Dubs, as well. BWLD P/E Ratio (TTM) data by YCharts. Investors who have been waiting to own a piece of Buffalo Wild Wings might consider taking a closer look. 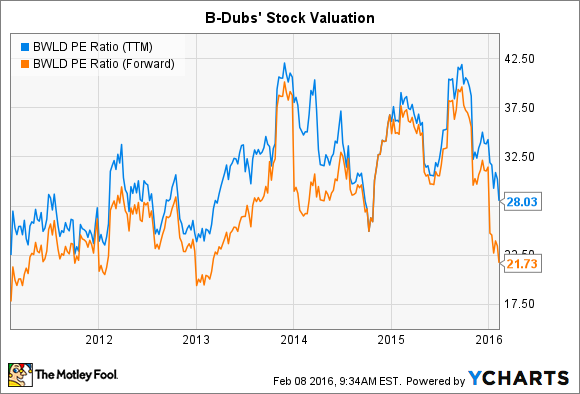 B-Dubs' valuation, both in terms of past and future earnings, is the lowest that it's been in years.